From the plains of Illinois in the United States to Kazakhstan and, currently, his native Turkey, Cengiz Kara’s career has seen him collaborate with professionals from around the world. 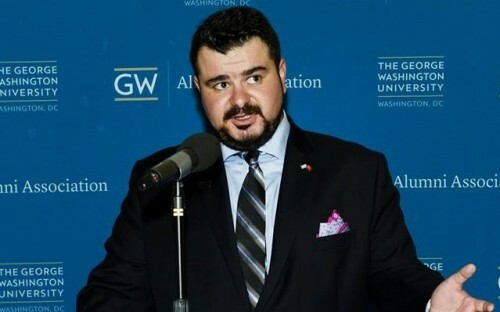 But that’s not too surprising, especially when you consider Cengiz’s time at the George Washington University School of Business (GWSB). In between his worldwide travel, Cengiz still found time to graduate with an MBA from the business school in 2014. During his time at GWSB, he was an extremely active part of student life, serving on the school’s student association and even hamming it up on-stage with the university’s improvisational theatre group, the MBA Follies Comedy Club. A veteran marketing specialist, Cengiz used this GWSB MBA to further hone his skills in the field. His MBA’s summer internship was spent in the marketing department at a Choice Hotels International. He is now channeling his outgoing personality and GWSB education into his role as a product and segment supervisor for Borusan Makina, Caterpillar’s dealer in Turkey. Cengiz continues to participate in GWSB MBA events in Turkey, where he is the president of the school’s local alumni committee. When I was searching for schools to apply to for, the location was the key factor. GWSB’s location in the heart of Washington DC was instrumental in my decision to apply and attend the school. Being only a few blocks away from the World Bank, IMF, the White House, US Congress and many other institutions is a great motivation for a business student. GWSB’s expertise in international business was also one of the main elements for me when choosing the school. George Washington University is a socially and demographically diverse university where there are many international students and many social possibilities for students. How did the school’s global focus benefit your MBA experience? It helped immensely. As an international student, it was great to interact with individuals from different backgrounds, experiences, cultures and beliefs. Providing the ability to look at matters from different perspectives and even from different belief-culture systems have been very useful for me, both during my studies and after graduation. Not only were we able to analyze many multicultural cases in class, we were also able to look at them from the eyes of people who have different ways of thinking. How has the GWSB MBA helped you in your career so far? As a marketing professional, it is very important to be able to empathize with the customer, the supplier, and your team. The vast international culture of the GWSB has been very useful for me to be able to look at things from different perspectives and to empathize with people. I can see its value at my job every day.